You have probably scrolled down your Instagram account and seen a bunch of selfies. You've probably haven't given selfies or "selfie culture" much thought. Inspired by selfiecity.net (an organization that 'investigates' selfies), I chose to analyze three instagram accounts from New York City and asked the question "What kind of stories do their selfies tell? What greater cultural trends do they hint at?" Below I have added a trailer that brings the stories of these three Instagram accounts all together. 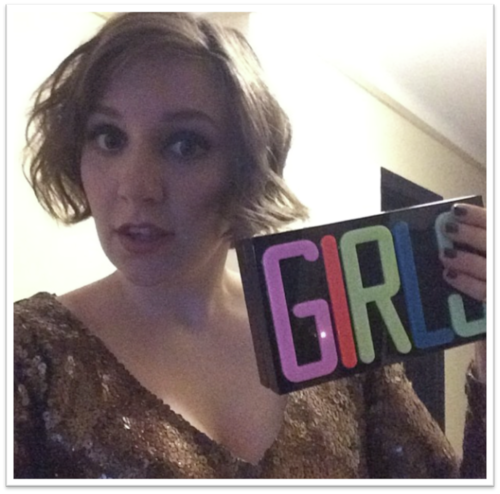 Nothing says New York like actress Lena Dunham, who also happens to be screenwriter, producer, and director. This native New Yorker is mostly known for her role in the hit HBO series Girls and her independent film Tiny Furniture (2010). Lena has been nominated eight times for Emmy Awards, won two Golden Globe Awards for Girls and is also the first woman to win a Directors Guild Award for Outstanding Director in a Comedy Series. 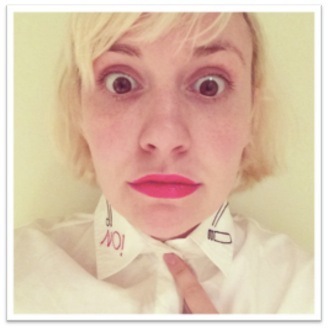 Not only is Lena Dunham an amazingly accomplished woman, she is also member of the selfie-taking Instagram community. It’s not unusual for celebrities to share their personality life via social media platforms but Lena Dunham does so and she does it her way. Lena likes to share anything from her glamorous red carpet moments to her not so glamorous “just got out of bed” selfies. Why? I think Lena is trying to communicate the fact that even though she is a celebrity she is also just a human who is not always camera ready. Although I believe digital media helps foster a more connected world, I also believe that social media platforms like Instagram can create a social gap between celebrities and their fans or just ordinary people. When people see celebrities post selfies on Instagram their picture is immediately flooded by comments such as “#goals” or “I wish I had your life.” Celebrities who display their luxurious lifestyle on Instagram tend to show off a materialistic persona by flashing their expensive cars, clothes, houses etc. Subconsciously, a lot of people who belong to the Instagram community want to emulate the lifestyle these celebrities live. I admit I’m also guilty of this. When a celebrity posts a selfie with the latest jewelry or shoes my subconscious goes “I want that!” or “I need to wear that!” The impact that a celebrity can have through social media is quite overwhelming. 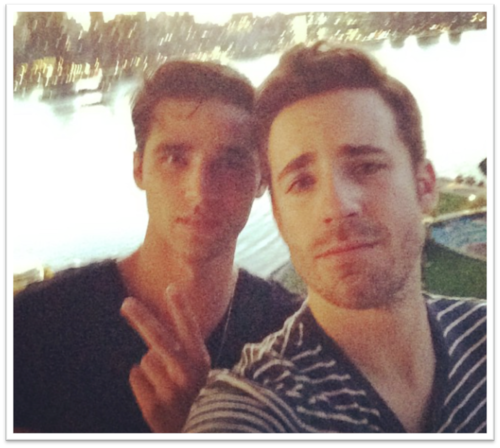 With a simple tweet or selfie, they are able to communicate a message to an audience of thousands sometimes millions. Of course it all comes down to what story you choose to tell via selfies. Lena doesn’t choose to tell the story of a glitzy A-list actress; she does the complete opposite. What I love about Lena is that even though she is a celebrity she’s also relatable. She posted a selfie of her taking a bite out of a huge slice of pizza and saying it’s the special medicine her doctor prescribed her for her headache. 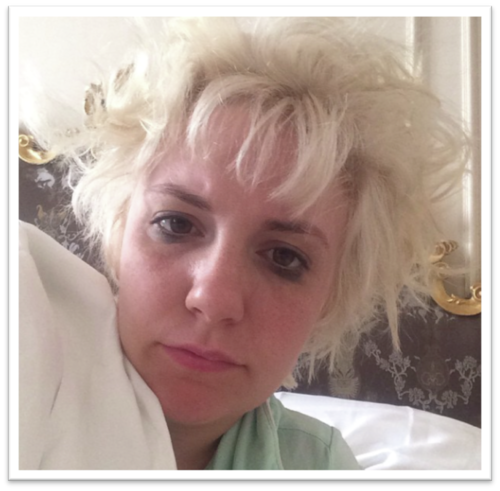 To say that Lena Dunham is funny on Instagram would be an understatement. Another one of my favorite selfies of hers is one she took literally seconds after waking up. You can see the eye makeup she forgot to take off the night before. She captioned the picture “Is this what Beyoncé was talking about?” alluding to Beyonce’s song Flawless which famously goes “I woke up like this.” Lena also says that it’s kind of disappointing that her look wasn’t fueled by one alcohol; her captions never fail to make me laugh. I believe that Lena is successful in using her sense of humor to break down the wall between celebrity and fans. I think it’s important to remember the influence that celebrities have on social media. Lena likes to spread awareness about issues like animal adoption. In a selfie she recently took with her dog, she captioned her picture “But of course…Adopt don’t shop!” You can say that her dog is a frequent guest star in Lena’s selfies. We need more celebrities who are active on social media to shed light upon issues like animal adoption. Social media is a powerful platform; are using your selfies for the common good? 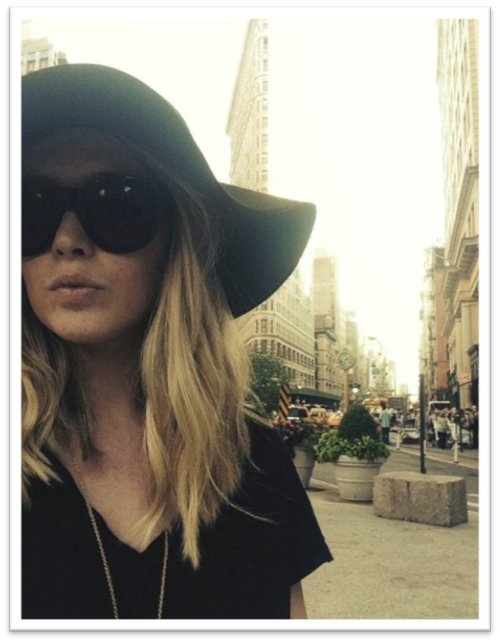 I wrote this vignette as if I was my friend, Lauren, the most fashionable city girl I know. I see my city in colors and patterns. I trace the shapes of this urban microcosm with my eyes. I dissect everything through the lens of fashion, it’s my biggest passion and that’s what I want people to see when they look at my selfies. I’m just your average city girl trying to make it in a really competitive industry and who wants to share her experiences with the world. essentially what it is. New York Fashion Week was probably one of the biggest highlights of my life. Being a student at the Fashion Institute of Technology definitely has its perks! I escorted the queen of Vogue, Anna Wintour, to her seat but unfortunately wasn’t able to take a selfie with her. I did, however, get to take a selfie with Coco Rocha, world-renowned fashion model! These opportunities don’t come very often but a selfie makes these amazing memories as tangible as can be. The city is one of my favorite backgrounds for my selfies. There is something aesthetically pleasing about the way the skyscrapers stand tall and the way people walk with a great sense of purpose in the back of my pictures. In the midst of all this chaos, you are able to capture a frozen moment with a simple selfie yet still see the movement. I love how this city makes me feel so small; it really puts things in perspective. I want people to know that I can be glam yet edgy. I’m not afraid to be daring and mix prints. I can rock a shimmery pink gloss or a bold red lipstick. I’m not scared to wear my ‘FLAWLESS’ Beyonce t-shirt and take a selfie with my shades on. For me fashion is all about being fierce and confident. I don’t have a typical selfie pose, I like to switch it up here and there. I have to admit that I do the ocassional ‘duck lips’ pose in my selfies but only ironically, I promise. I also want people to know that I can be silly and goofy once in a while. My hair isn’t always straightened or in tight curls. There are times when a messy bun or a loose ponytail captures my personality best. The selfies I take with my nerdy glasses and a fresh face are sometimes my favorite ones. 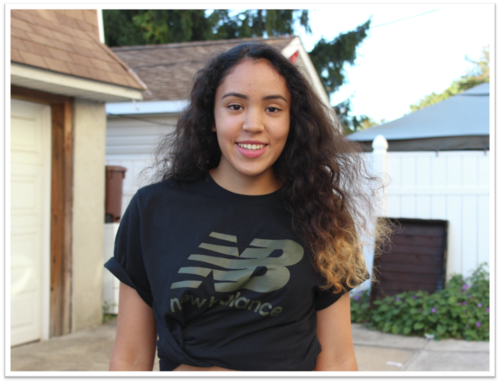 I don’t’ always have to hide my natural beauty with make-up. I welcome all my flaws and learned how to love them. I use Instagram as a platform to express my sense of style. I must admit that full-length mirror selfies are my favorite; it’s the best way to showcase my outfit! I want to share my style with the world via my selfies. I want people to know that fashion isn’t about the brands you wear. I put together all my favorite outfits using the clothes I hauled at thrift store. Style doesn’t have to be expensive. The fashion industry celebrates creativity, a quality that I seek to deliver through my selfies. But I’m not always caught up in the crazy world of fashion. I love spending time with my friends and family; it so much fun to feature them in my selfies! So what do my selfies say about me? I hope it’s that I’m a quirky fashionista, who loves life and isn’t afraid to be confident! I hope that by taking selfies I’ll inspire others to share their beauty as well. Calvin recently tweeted “i just realized the entirety of my Instagram is just me posing with hot guys...” Although, this is indeed true he also posts plenty of selfies! According to Selfiecity.net, women are most likely to post selfies then men. Not Calvin. He likes to post selfies quite frequently. Calvin Stowell (@aurosan) is the director of digital and content for DoSomething.org in New York City, a non-profit organization for young people and social change. When I first met Calvin during my fall internship we bonded over our love for all things Internet. Calvin is present on so many social media platforms, using his different forums to spread news about DoSomething.org campaigns, gush about Zayn Malik, and of course post selfies. When I first met Calvin during my fall internship we bonded over our love for all things Internet. Calvin is present on so many social media platforms, using his different forums to spread news about DoSomething.org campaigns, gush about Zayn Malik, and of course post selfies. With almost fifty thousand followers on twitter, Calvin is known for his One Direction obsession, sarcastic tweets and goofy personality. So does his Instagram selfies reflect his personality just as well as his tweets? I think so. After scrolling through Calvin’s Instagram, I noticed that Calvin shows variety in his selfies. However, he does have a main selfie pose that his coworkers even coined the term “Calvin face.” (Funny story: they all surprised Calvin by recreating his infamous selfie pose and posted their remakes on the front door of the office) The “Calvin face” can be described as follows: direct look at the camera with a little head tilt towards the sky, head turned slightly towards the right, half smile, tightened eyebrow muscles and a semi-confused yet happy expression on his face. By what I can tell by his selfies, Calvin seems like an ordinary, chill guy who likes to share his experiences with the world. He likes to take selfies when he’s at exciting events or even just a casual selfie from his desk at work. 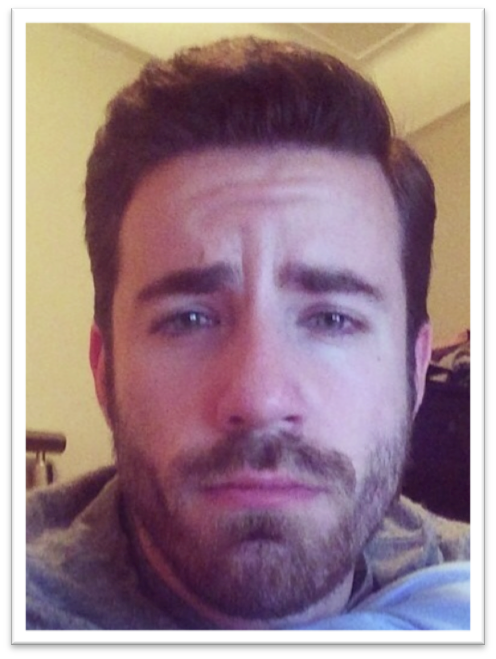 He doesn’t smile very often in his selfies but he makes up for it with his humorous captions. He occasionally takes a break from his usual “Calvin face” selfies by posting funny selfies. For example he posted a selfie where he poses with a donut and explains his confusion on why it came individually wrapped. When I narrowed Calvin’s selfie by demographic, pose, feature, and mood with the Selfieexploratory option on Selfiecity.net I found that of the almost one thousand male selfies who live in New York City about four hundred shared similar features. So, is the “Calvin face” really that unique? Maybe not entirely. However, if there’s one thing that set his selfies apart from the rest it’s his eyebrows. It might seem ridiculous but I am immediately drawn to them. I believe that Calvin’s selfies hint at a greater cultural trend at the moment that is the importance of eyebrows. Forget about how your hair looks like, it’s all about eyebrows. You cannot scroll down an Instagram feed without seeing selfies that are tagged #eyebrows, #eyebrowgamestrong, or even #eyebrowsonpoint. They are the face-framing features of 2014! When it comes to analyzing selfies your eyebrows can do a lot to change your expression and the symmetry of your face. It is trend made popular on Instagram by celebrities like Victoria’s Secret Cara Delevigne, Chantelle Jeffries, and Kylie Jenner, and has spread all over. For ordinary selfie-takers like Calvin, eyebrows continue to be the focal point of a lot of people’s selfies. It’s all about having dark, well-shaped eyebrows! Although I didn’t understand the eyebrow craze now I see how they make you look more alert and your cheekbones more prominent. Calvin’s eyebrows make him look well polished yet not too serious. Your eyebrows can speak volumes and so do your selfies. What do your eyebrows say about you? My name is Stacy Aguilar, and I am 18 years old. Currently, I am a Macaulay Honors student at the John Jay College of Criminal Justice. I am majoring in Forensic Psychology, and minoring in Chemistry. I chose to major in Forensic Psychology because A) my obsession with Investigation Discovery B)it's the perfect cross between psychology and the criminal justice system. I've always been interested in learning about the brain and behavior. With the help of Dr.Jillian Grose-Fifer, I've recently become involved in psychology research. Although I can't say much, right now we are looking at personality traits and their relationship to academic success. Being introduced to the world of research and tedious data collecting, has made me even more excited about my major! The two disciplines might seem like an odd combination: forensic psychology and chemistry. I decided that I not only want to understand the world in terms of behavior, but also I want to learn about the world on the micro level. I am a member of La Voz and the Dominican Students Association, two clubs that allow me to learn about my Hispanic culture and become a part of an empowering Latino community. Although I was born in America, my parents are from Ecuador and I've always been proud of where I come from! I am also on the Student Council Street Council street team, which means I’m responsible for promoting different events at school. As you can tell being involved on campus is something that is very important to me. More randomness: I love watching TED talks. No seriously, I binge watch them like people watch episodes of their favorite show on Netflix. I love seeing amazing thinkers and doers share their ideas with the world on pretty much everything from science, love, media, relationships, psychology, etc... most under fifteen minutes! Knowledge is meant to be shared not hoarded. I mean what is the purpose of having great ideas if you can't communicate them? One of my greatest ambitions in life is to have my own TED talk, I'll make it happen one day. My two favorite TED talks are Brene Brown's "Power of Vulnerability" and Sarah Kay's "If I should have a daughter." I'm also passionate about fitness and health. I love finding ways to stay active, whether that be going for a run or killing a workout at the gym. Those exercise "high" endorphins are addiciting. Living an active life has taught me discipline and self-motivation. It has shown me the importance of physical/mental health. Being as my ePortfolio is about media and it's affects, It should come to no surprise that I use social media frequently (although not as much as I did before). I like going on Twitter, Instagram, Facebook, Tumblr, Pinterest and I even create Youtube videos! For Stacy's ePortfolio, click here.